Today’s post is all about the best gifts for the leading ladies in your life. Whether it be your mother, mother-in-law, sister, or best friend – there’s a little something for everyone. 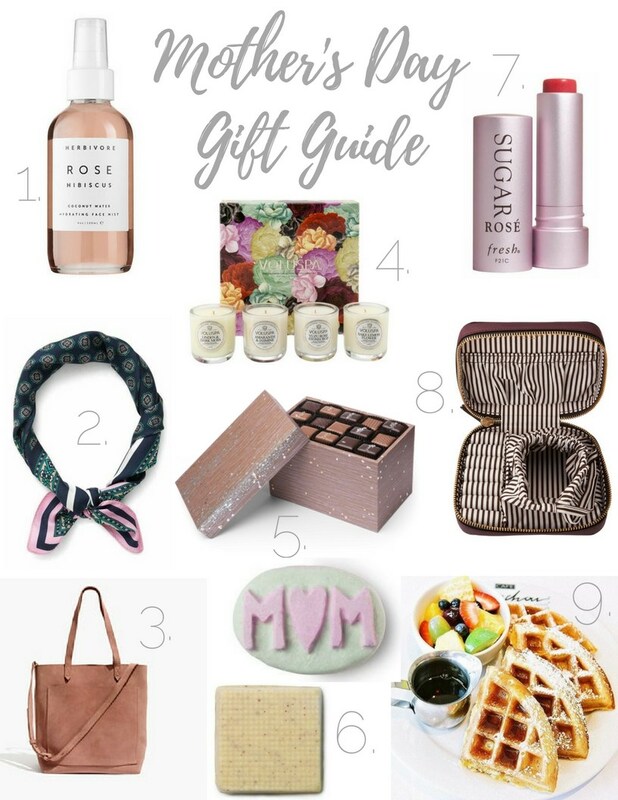 These gifts aren’t limited to just Mother’s Day, any of these items would make great birthday or shower gifts, or even a nice treat for yourself (you deserve it)! I’m a bit late to the game but I’ve recently discovered how amazing facial sprays are. They keep your face feeling fresh and hydrated all day. You can throw it in your gym bag, have it on your bed side table or keep it in your desk at work for a quick refresher. I love Herbivore products because they use all natural ingredients and the packaging is gorgeous. I’m a sucker for great packaging! You can find their products at locally at Sephora or Urban Outfitters. Scarves are classic and timeless. Thin, light weight scarves are having a moment and they make great gifts because they’re so versatile! You can wear it around you neck, use it as a head band, tie it to your bag, or on your wrist. I love this silk foulard print scarf from J. Crew but you can find similar styles at department stores or anywhere that sells clothing and accessories. Every mom needs a heavy duty tote to haul all her necessities. Totes are not only great for everyday use but they come in extra handy when traveling. I personally like totes from Madewell because they are great quality and have several color options at varying price points. Candle sets are perfect for the candle lover in your life. VOLUSPA and Pomme Frites Candle Co. are just a few of my favorite brands because they burn slowly and smell amazing! You can purchase them online or find them locally at Madewell, Urban Outfitters, and Altar’d State. Does this really need an explanation?! Chocolates are a quick, easy, no fail gift option. I’m obsessed with Fran’s chocolates which is based in Seattle. They are known for their grey and smoked sea salt caramels but their truffles are just as delicious. If you or anyone in your life is a chocolate lover I highly recommend Fran’s – you won’t be disappointed! I’m a die hard LUSH fan and gift their products often. If you’re not familiar with LUSH, they are cosmetic brand that specializes in handmade bath and hair products, skin care products, fragrances, and soaps. They sell prepackaged gift sets which makes it a super easy gifting option. My personal favorites are their bath bombs, bubble bars, and body butters. You can never have too many lip balms. It’s a product everyone uses on a daily basis so it’s guaranteed to get some use! When buying a lip balm I look for options that also have sunscreen. The Rose Sugar Lip Treatment from Fresh and Smoothnesss from Nivea are my go-to’s! This is a perfect gift for anyone who travels often. This handy accessory features a full zippered closure for secure storage and transport of your jewels. No more tangled messes! Take your mom on a brunch date at your favorite spot! My local favorites are Patachou, Milktooth, and Ruth’s Cafe. When in doubt, you can’t go wrong with a bouquet of her favorite blooms! That wraps up my Mother’s Day/shower/birthday/any occasion gift guide for the special ladies in your life. I hope that this guide helps you the next time you’re shopping for a gift. Happy (early) Mother’s Day to all the mom’s out there!